Many were slightly disheartened by the lack of classic Doctors in BBC's 50th Anniversary Doctor Who special, Day of the Doctor. Well that was until the feature episode's conclusion, which saw archive footage of classic Doctors used, prior to the return of the iconic Tom Baker in a small cameo. Those of us that had hoped for a Five Doctors style bonanza, never got the goods. It appears fans of the classic series were not the only ones to be somewhat disappointed by the lack of the original Doctors - the stars were too. Thankfully, the brilliant Peter Davison (aka the Fifth Doctor) took matters into his own hands and wrote and directed, tongue-in-cheek short, The Five(ish) Doctors Reboot, which premiered on BBC's Red Button service on Saturday night. 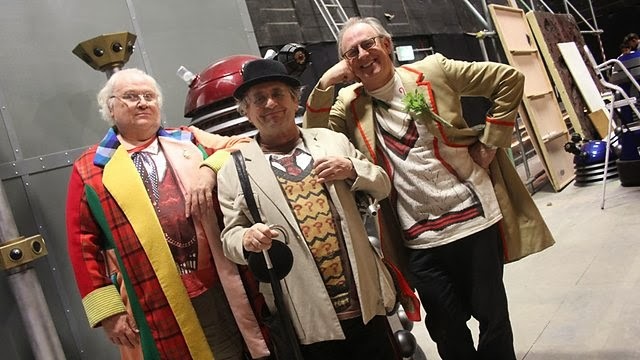 The short playfully captures Davison, Colin Baker (the Sixth Doctor), and Sylvester McCoy's (the Seventh Doctor) desperation to be included in the BBC special - and them attempting any means of being involved. Whilst it is perfectly clear that this is intended for laughs, it is hard not to detect a little truth in the disappointment these stars face. Davison has roped in a variety of Doctor Who stars, old and new for cameos in the short, including Matt Smith, David Tennant, Paul McGann, John Barrowman, and Russell T. Davies, being perhaps the most note-worthy. You can watch Davison's mini-masterpiece on iPlayer below. We might be inclined to say we prefer it to the Day of the Doctor.